where after nearly a decade of "research and developement"
she provided us with our first litter in November of 1997. So it seems that good things DO come to those who wait! for the ACDCA in 1993.
up numerous class placements and awards along the way. 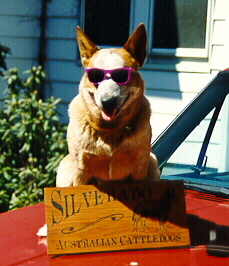 Sage had a very busy 1997 as a real "working mom,"
and winding up as the ACDCAs #8 Herding dog for the year. perhaps another foray into motherhead in the future. The possibilities are endless with this wonderful and versatile redhead! !